It is official; I *heart* New York. There are some must do things when in the Big Apple. Firstly, see the Statue of Liberty. I can’t think of a symbol more iconically American. Next, be sure to see a Broadway show. There is some great talent there, even if you’re not into musicals. You’ll also want to soak in the splendor which is Times Square at night. The lights and just how busy it is is mesmerizing. 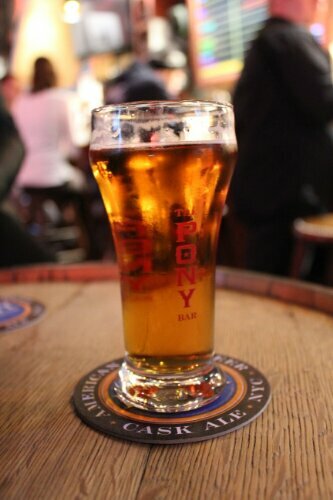 Finally, the last MUST do thing in New York is go to the Pony Bar. Pony Bar is located on the corner of West 45th St and 10th Ave in Manhattans “Hell’s Kitchen” district. 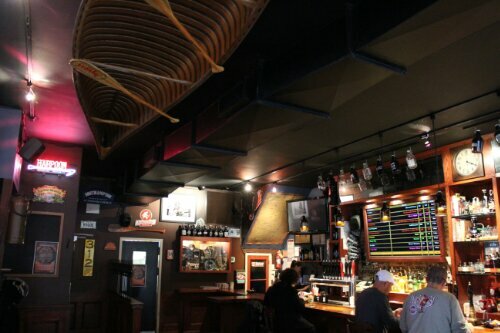 This small bar boasts a wide range of taps with 2 hand pumps of phenomenal, American-only craft beer. Being from Canada, the stigma has always been that Yank beer was weak in strength and flavour. Basically, it sucked. As this may be true for their macro brews, the US of A is leading the charge on the world stage for craft beer and Pony is only to happy to show it off. 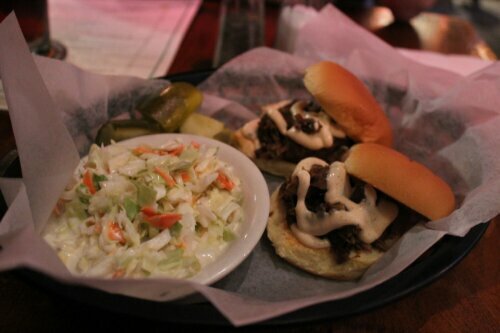 Pony Bar caters to all tastes from Pilsners to Imperial Stouts with a little bit of everything in between. I had a few on two separate nights including these highlights. 1) Brew Free! Or Die IPA by 21st Amendment – Great pine and citrus hop taste. Everything I love about IPA. 2) Obovoid Oak-Aged Oatmeal Stout by Boulder Beer Company – It’s an aged stout; need I say more? This beer had an amazing richness to it with a roast toffee flavour coming through. 3) Wet Hop Experimental Ale by Blue Point Brewing Company – So fresh! Sweet, fruity aroma with a pine mouth feel. 4) Pumking by Southern Tier Brewing Company – Pumpkin spice beer that was similar to drinking a pie. Strong flavour that kind of overpowered anything else that you drank, but in a good way. It’s easy to get yourself into a long session at the Pony. It’s a chilled out atmosphere with unprotensious staff. Whilst parked at the bar, I heard a few requests for Heinekens, which were met with a friendly, polite “Sorry we don’t have any imports here”. This is much nicer than the ‘Why would you want that crap!” that I was about to say. And Canadians are supposed to be the polite ones… Aside from a knowledgable staff, the patrons of this establishment are top notch. I had a few spontaneous conversations with random folks throughout the nights involving beer, politics, travel, and anything other subject that came to my increasingly intoxicated mind. Everyone was up for a chat. The Pony Bar serves food in two forms: sandwiches and hot snacks. The wife and I partook in some Buffalo Chicken perogies as well as Lamb sliders and Duck sliders. Perogies, for the uninformed, are generally a potato or likewise filled dumpling of Ukranian or Polish descent. These particular perogies were stuffed with chicken and deep fried crispy. They came with a side of Buffalo wing sauce that brought it all together. The duck slider was amazing, but the lamb slider was to die for. If you make it there, make this a part of your experience. The lamb was so good, we got them both nights. 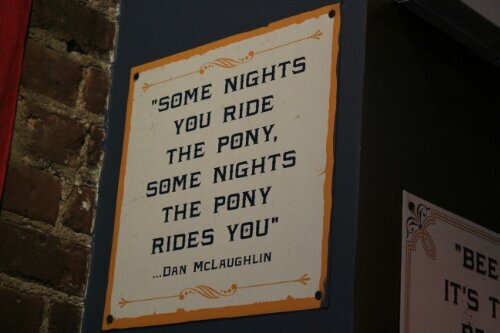 Now, I must admit, I didn’t stumble upon Pony Bar by accident. Truthfully, I had been waiting to go to this particular bar for a while. Why travel the globe to drink in a particular establishment, you might ask? Why, to get an Untappd badge, of course! Pony Bar is one of two bars in the world where you can get the coveted “Founders Hangouts” badge. 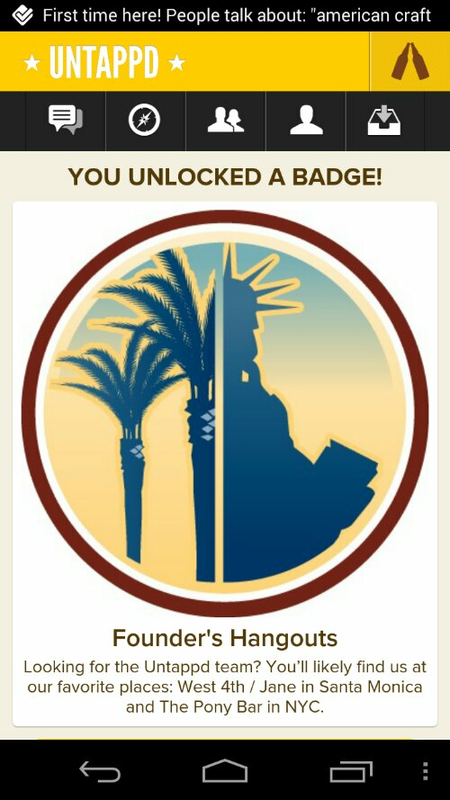 Pony Bar in NYC and Jane in Santa Monica are the favourite haunts of the creators of Untappd, thus, a special badge for checking in there. 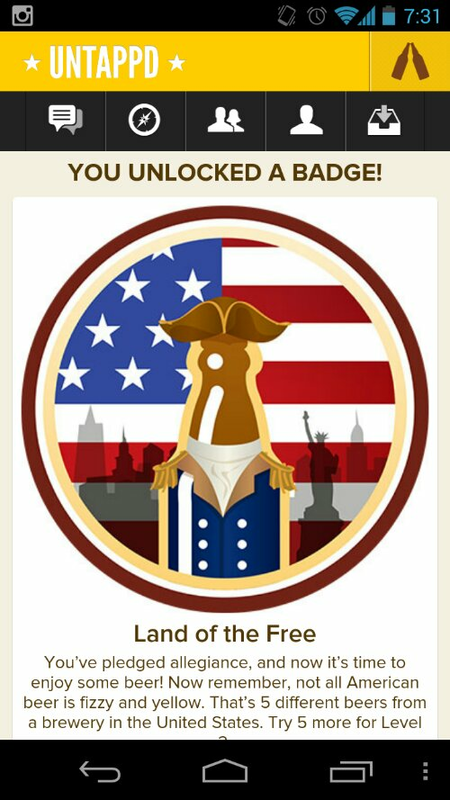 I was also able to knock out one of the new “Land of the Free” badge to level 2 as well. I’m not an alcoholic, but I do play one online. To wrap it up, Pony Bar was the cherry to my sundae of a visit in New York. If you ever find yourself in Manhattan, do yourself a favour and head in. You might find you end up loving New York that little bit more.